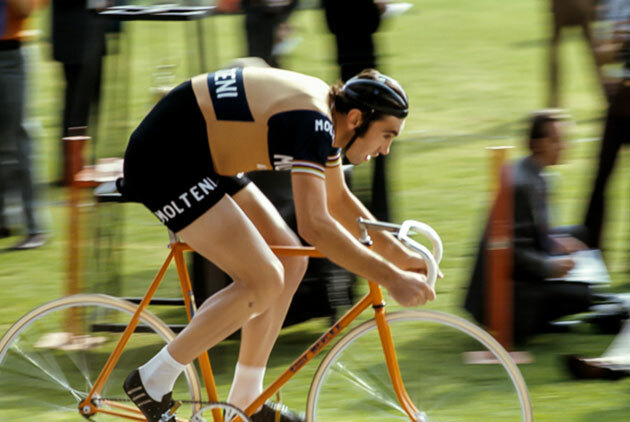 Eddy Merckx (Born June 17, 1945) was the greatest cyclist in the history of the sport. 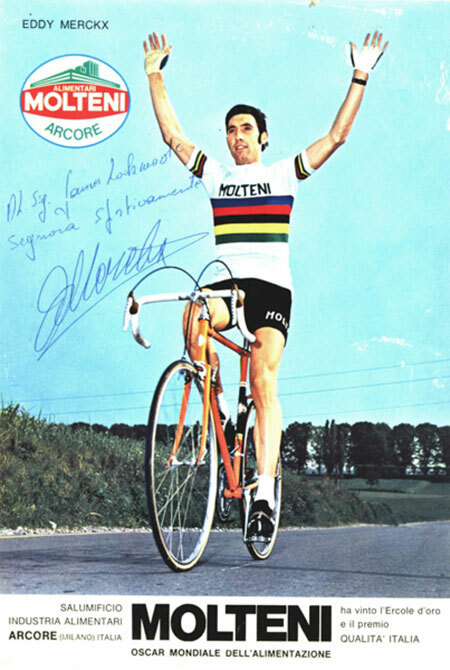 Scroll down this page to see that his list of victories is without equal. 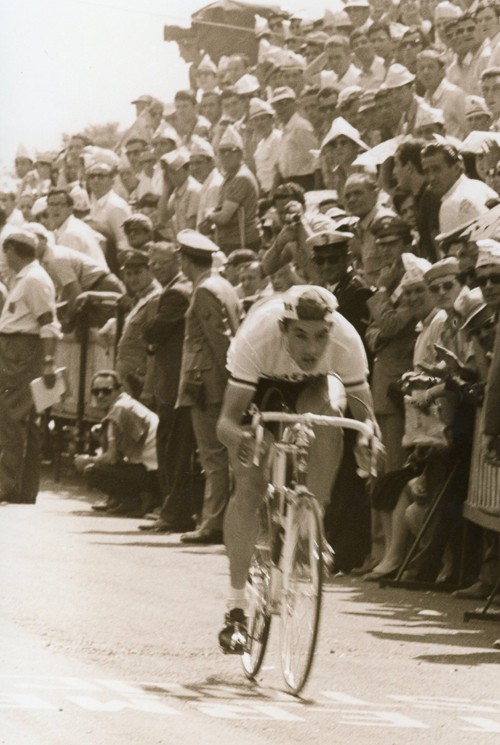 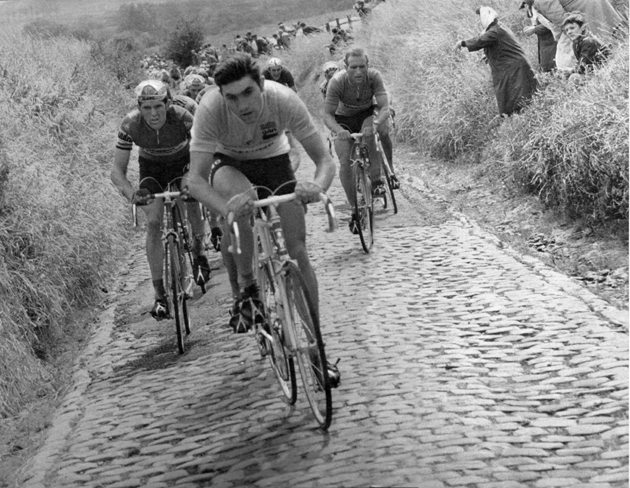 He was a complete rider: able to time trial, climb, race across cobbles and win track races. 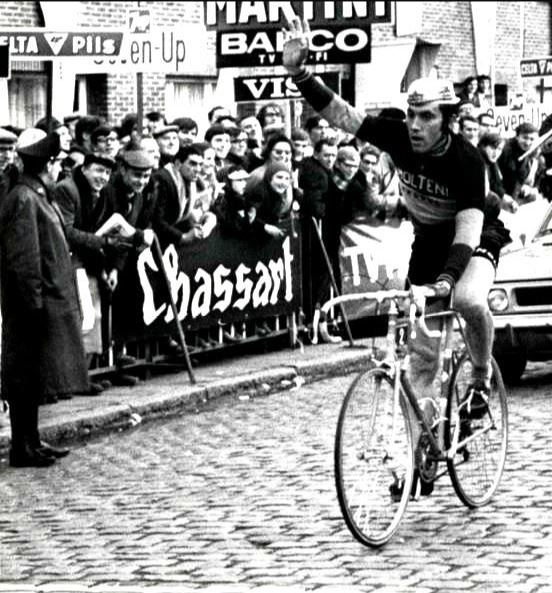 Combine that talent with an extraordinary passion for victory and you have a rider who contested more than 1,800 road races and won 525 of them. 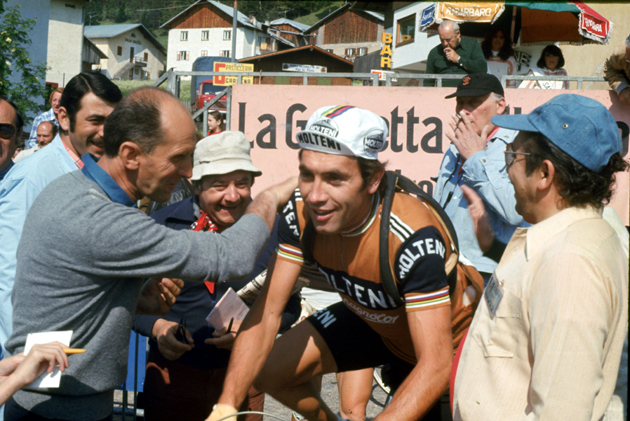 Only he (1974) and Stephen Roche (1987) have won the Giro d'Italia, Tour de France and World Road Championship in the same year. 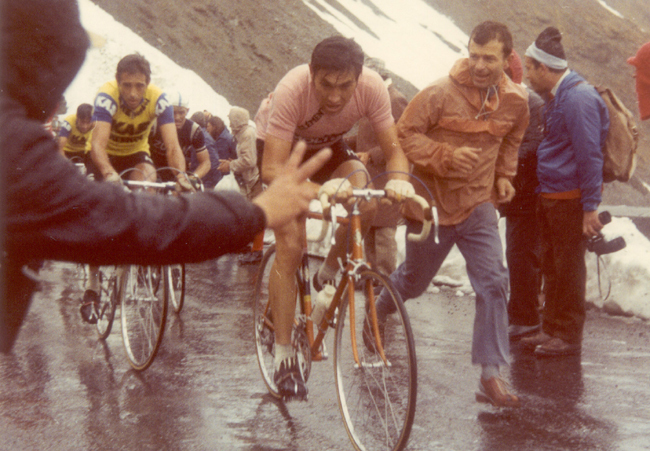 His 34 Tour de France stage wins is the career record as are his 96 days in yellow. 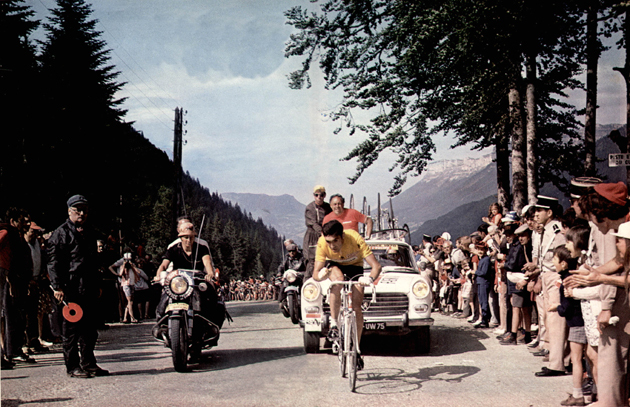 Of course, only Merckx could be on the cover of the second volume of our Tour de France history (see right). 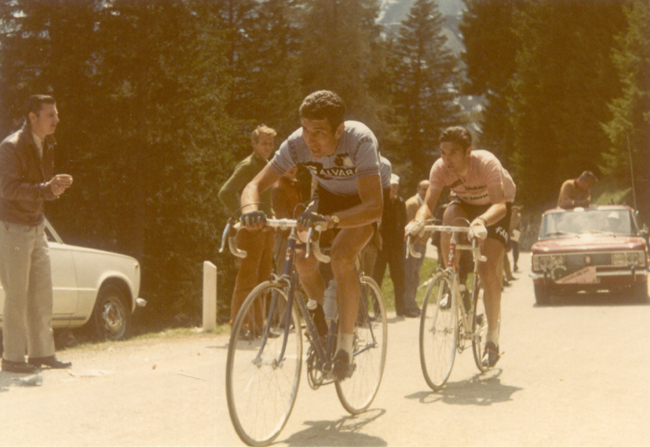 1971: Tour de France (GC, points, 4 stages), World Road Championship, Milano-San Remo, Liège-Bastogne-Liège, Rund um den Henninger Turm, Het Volk, Paris-Nice, Dauphiné Libéré, Midi Libre, Tour of Belgium, Giro di Lombardia. 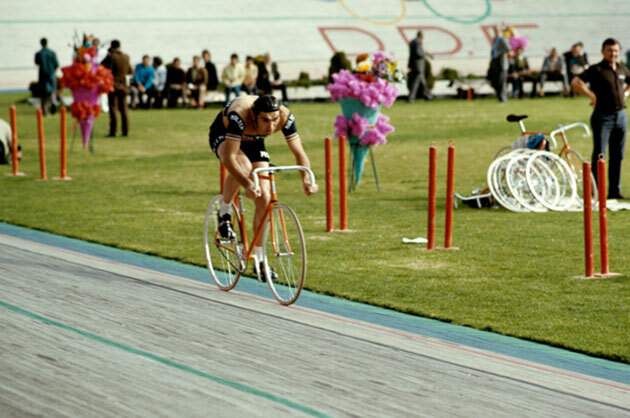 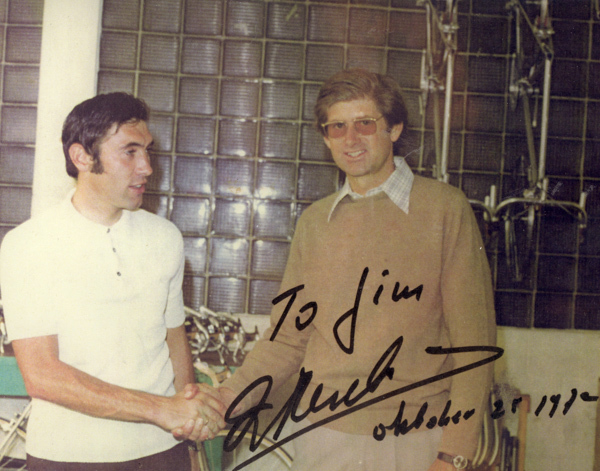 James Lockwood was in Mexico City that fateful week in 1972 when Eddy Merckx was there to set a new World Hour Record. 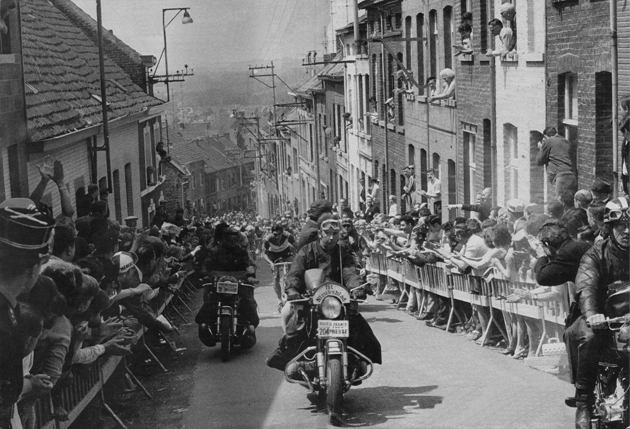 Mr. Lockwood has generously shared his historic photos of that incredible week. 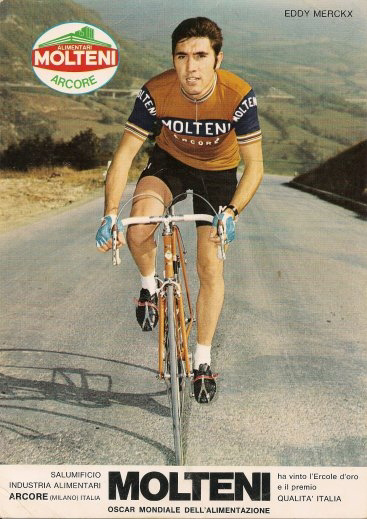 Owen Mulholland wrote of that famous ride. 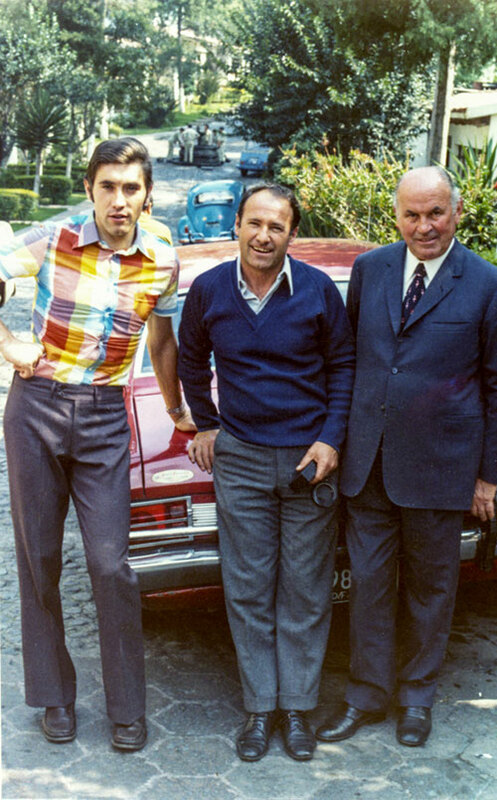 In Mexico City, from left: Eddy Merckx, Remo Vecchi and Signor Molteni, Eddy Merckx's pro team sponsor. 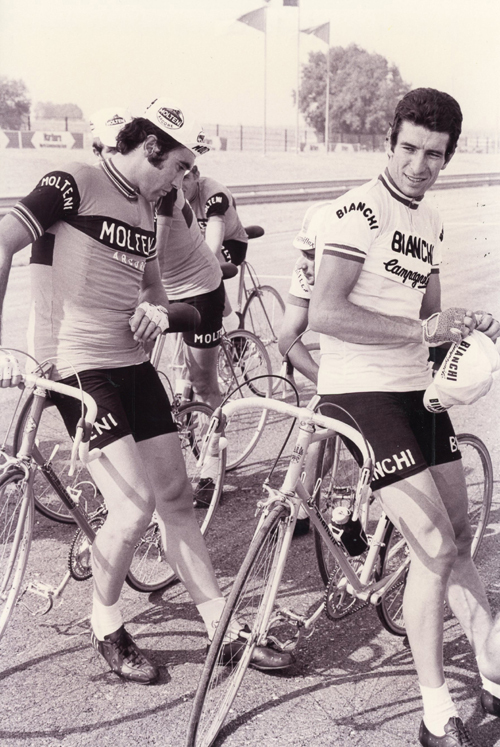 Vecchi was a former employee of Cinelli who was at this time an engineer at Acer-Mex, which produced Windsor bicycles. 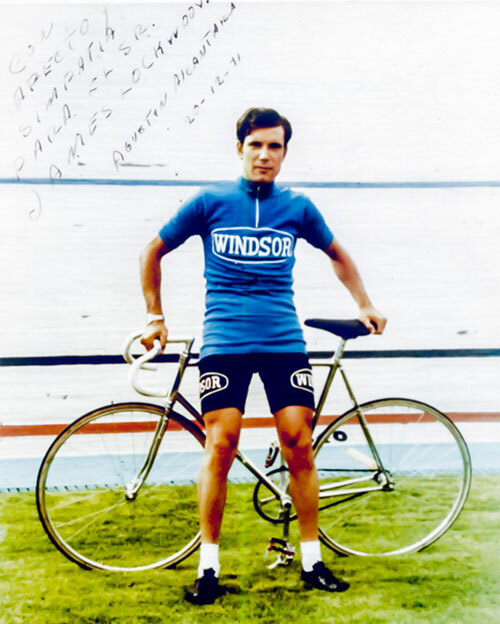 Hence the resemblance between Windsor and Cinelli bikes. 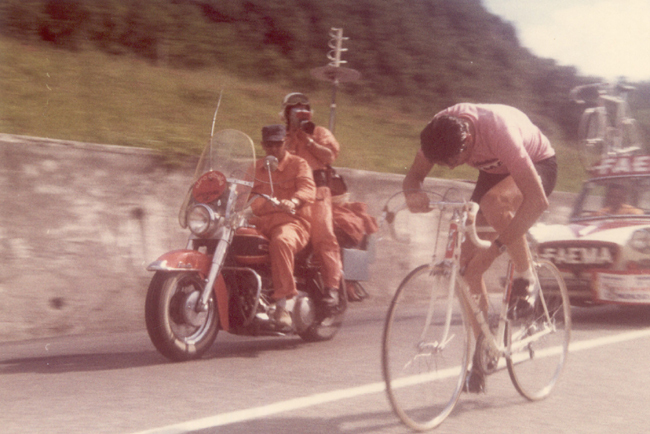 Along the way, Mr. Lockwood photographed Agustin Alcantara. 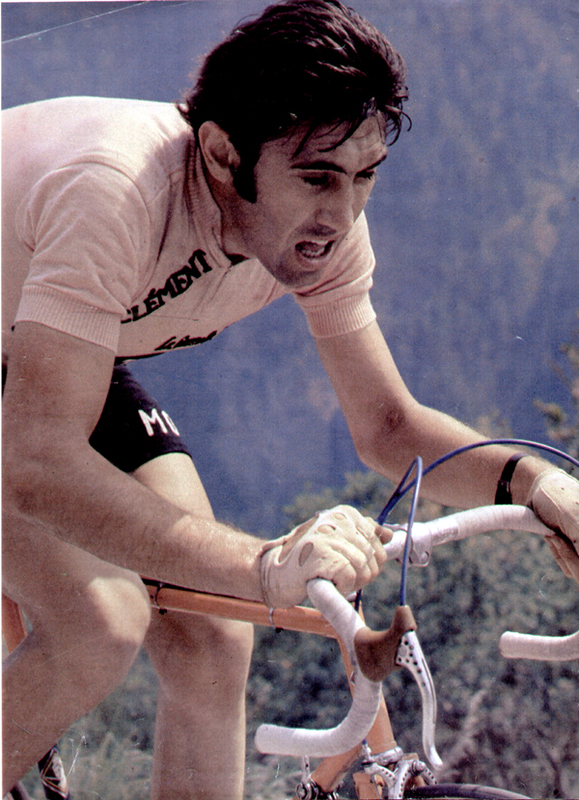 Racers of a certain age will remember that as leader of the Mexican National Team, Alcantara won the first Tour of California in 1971. 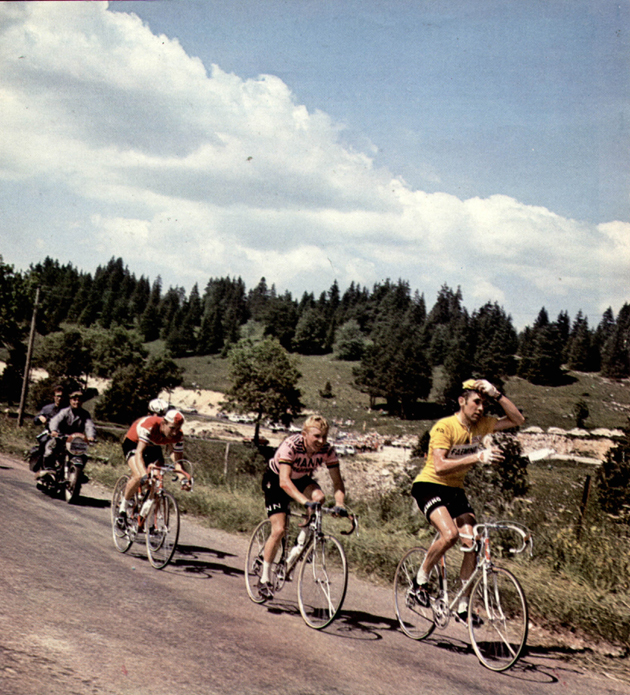 It should be noted that Peter Rich of Velo-Sport in Berkeley poured all of his money into an attempt to bring real stage racing to the western United States. 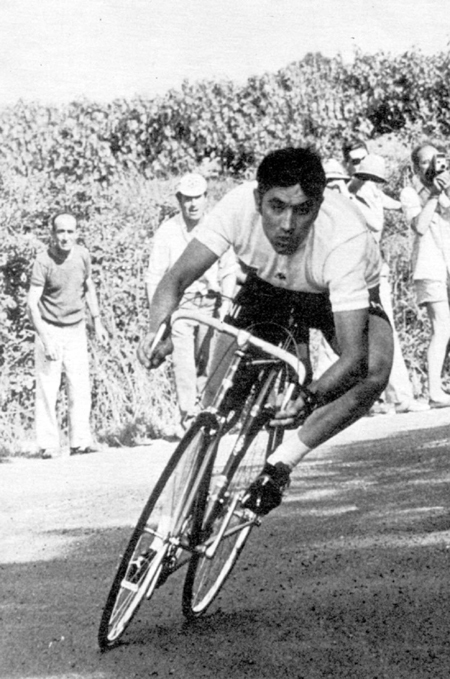 Alcantara died in 1979 when he was just 32 years old. 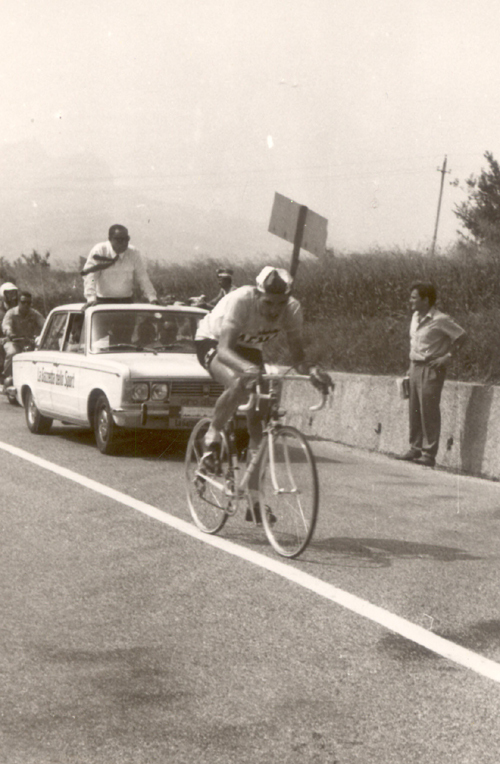 Meckx time trialing to San Marino in stage 16 of the 1968 Giro d'Italia. 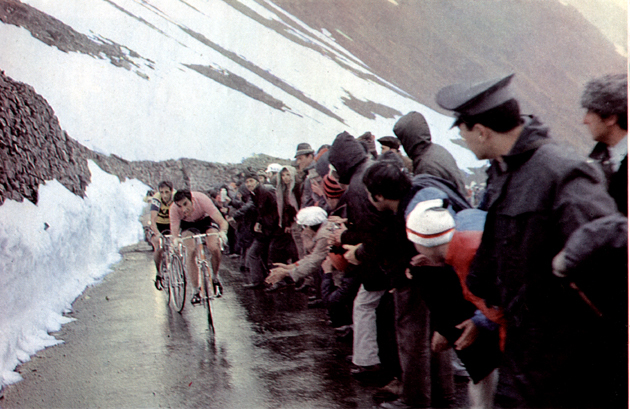 1969 Tour de France, Stage 16: Merckx escapes on the Portillon. 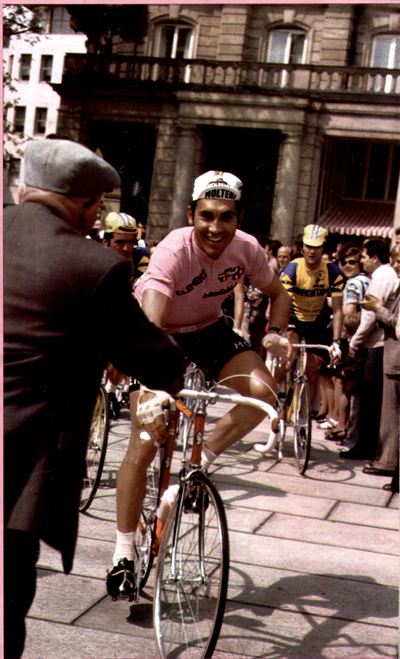 Franco Bitossi in pink with Eddy Merckx after stage 2 of the 1970 Giro. 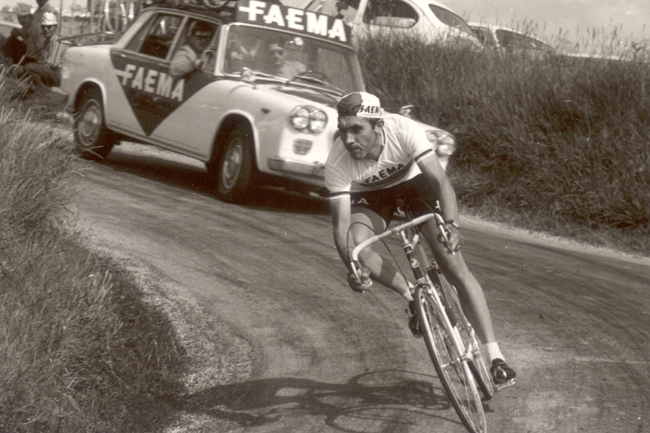 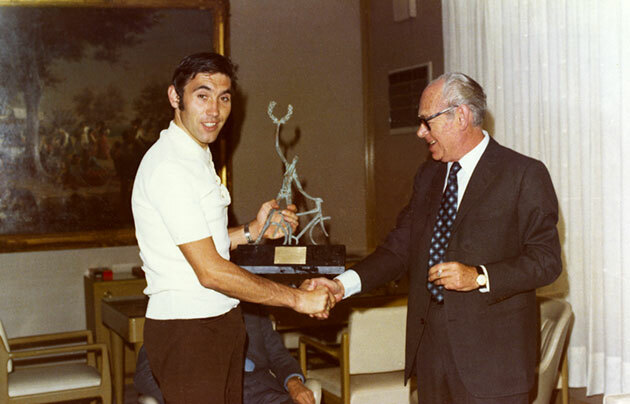 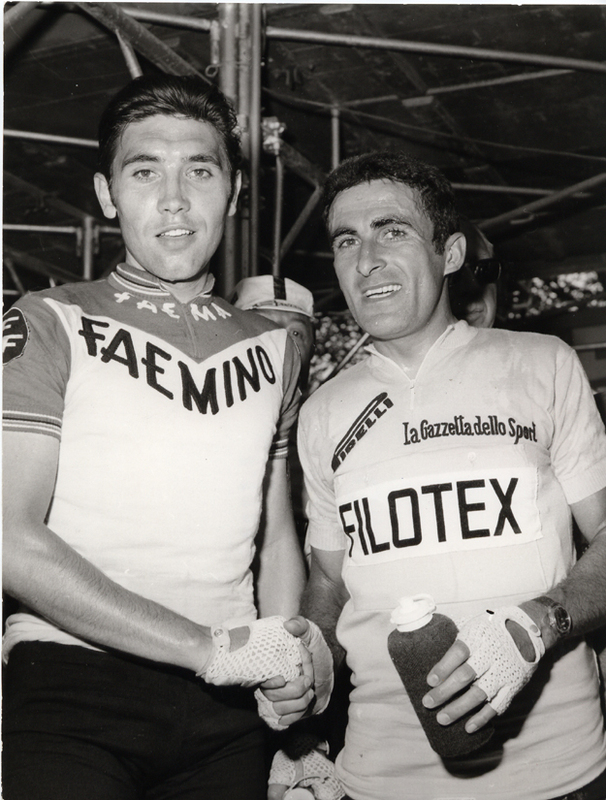 Eddy Merckx with maglia rosa Franco Bitossi early in the 1970 Giro d'Italia. 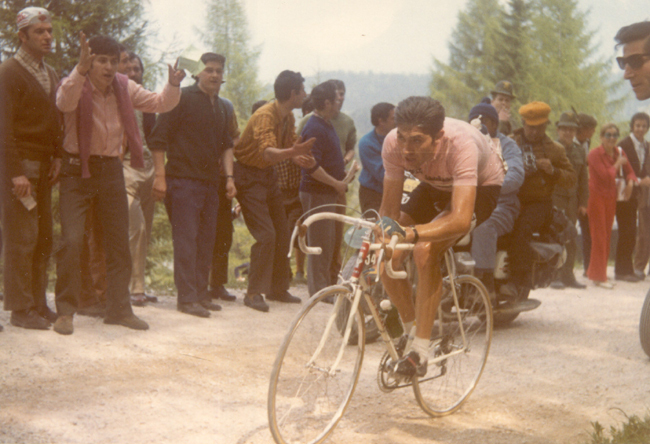 Merckx on his way to winning the stage 6 individual time trial (Bassano del Grappa -Treviso, 56 km) in the 1970 Giro d'Italia. 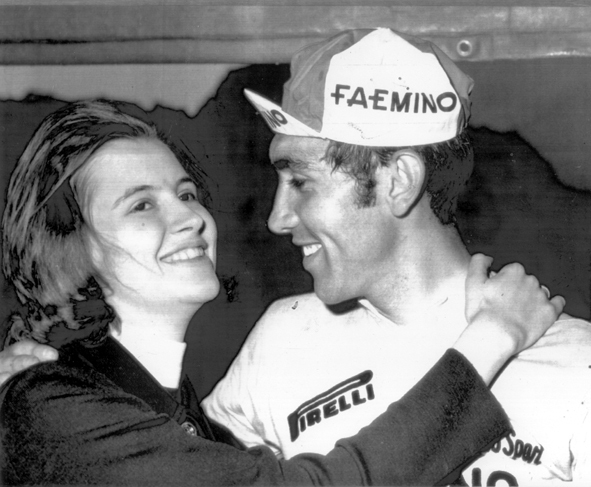 Mr. and Mrs. Merckx celebrate his victory in the 1970 Giro d'Italia. 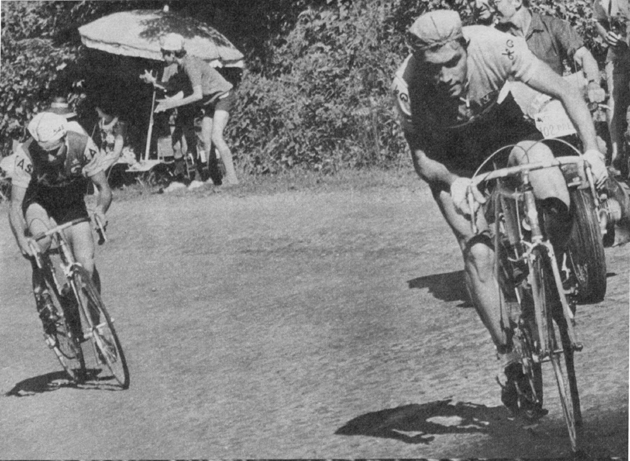 1970 Tour de France, stage 6 (Belfort - Divone Les Bains): Merckx leads Roger de Vlaeminck on the pavé. 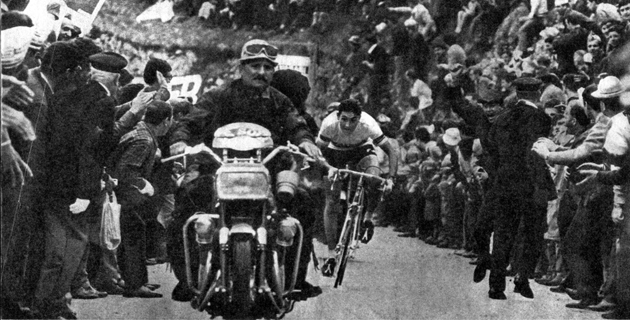 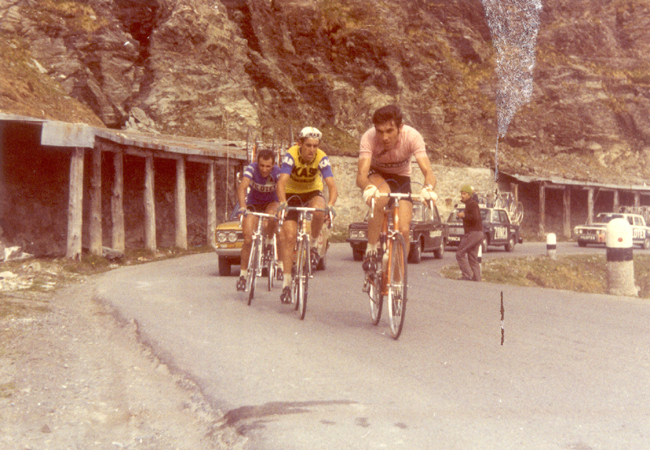 1970 Tour de France, stage 10: Eddy Merckx leads Georges Pintens, Joop Zoetemelk and Guerrino Tosello (hidden). 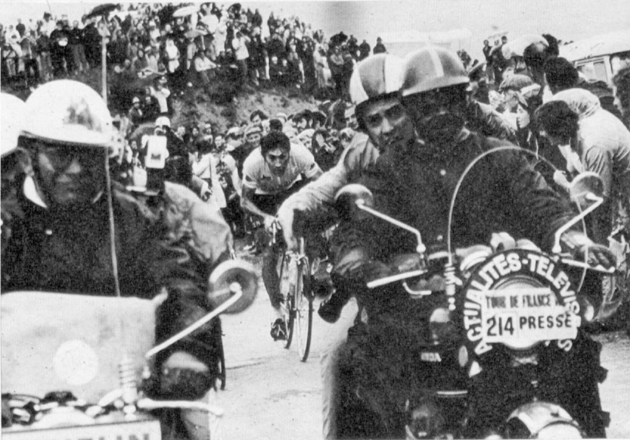 1970 Tour de France, stage 12: Merckx crests the Cucheron. 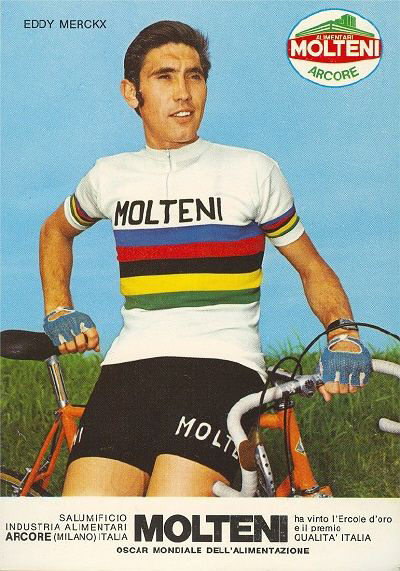 1971: Merckx wins the first of his two Omloop Het Volk victories. 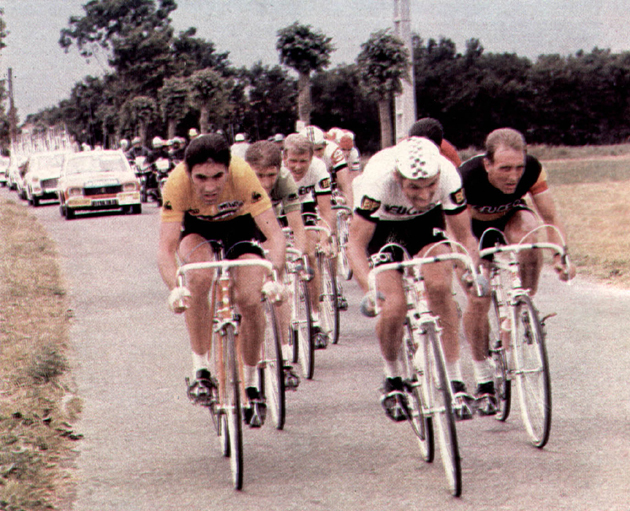 Merckx pulling the Molteni team on its way to winning the prologue team time trial in the 1971 Tour de France. 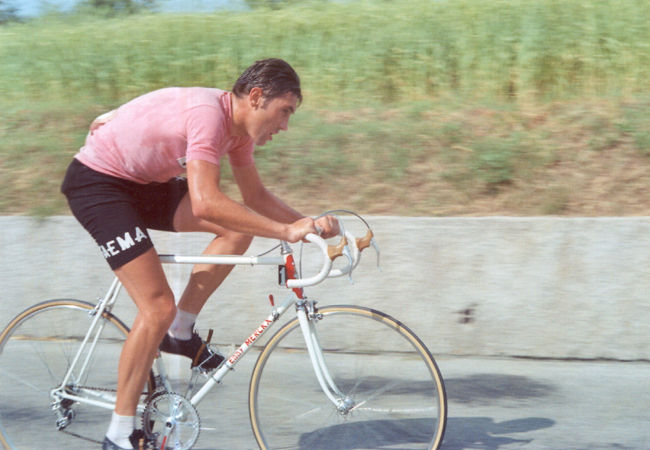 Merckx in the 1971 Tour de France, stage 13. 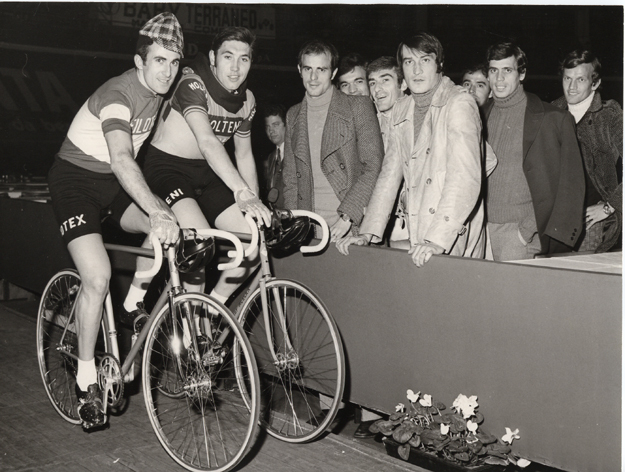 1972 Omloop Het Volk: Frans Verbeeck talks to Merckx before the race's start. 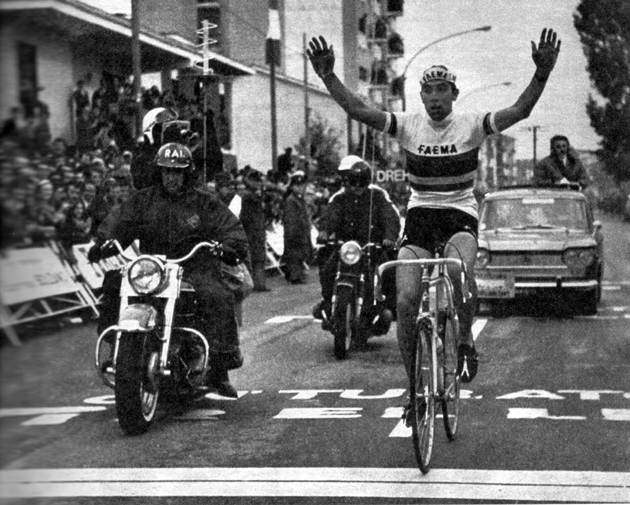 1973 Omloop Het Volk: Roger der Vlaeminck and Merckx have broken away. 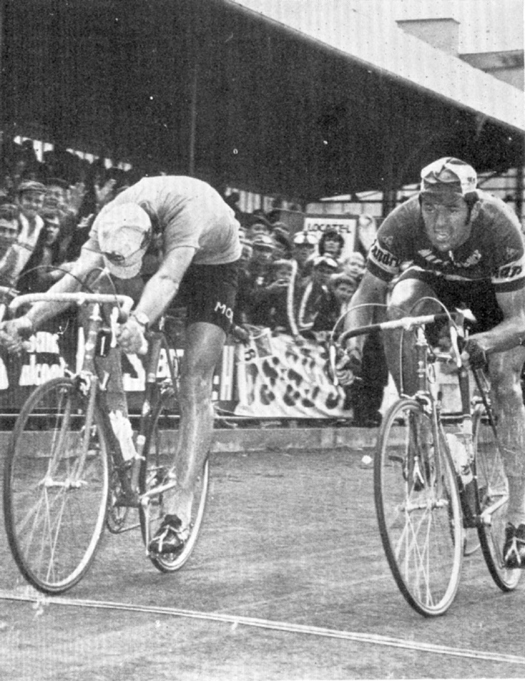 Late in the race Merckx would drop de Vlaeminck and finish two seconds ahead. 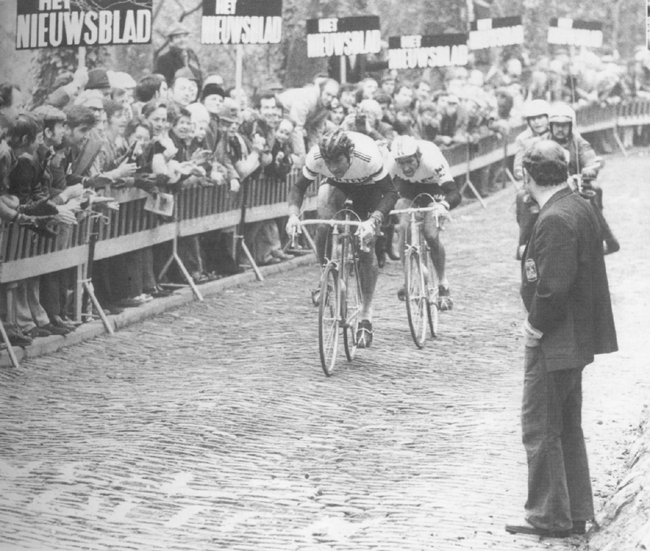 Another shot of the de Vlaeminck-Merckx break. 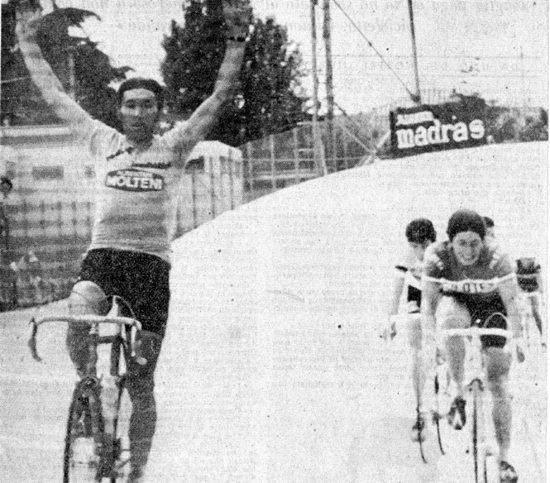 1974 Giro d'Italia, stage 21: Eddy Merckx wins in Bassano del Grappa in front of Francesco Moser and Felice Gimondi. 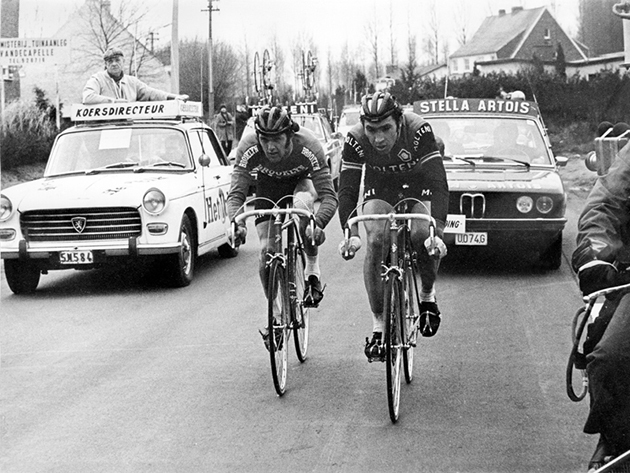 Eddy Merckx and Frans Verbeeck in the 1975 Ronde van Vlaanderen. 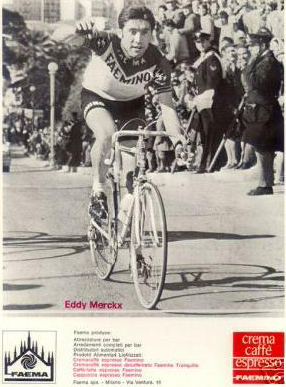 Merckx won. 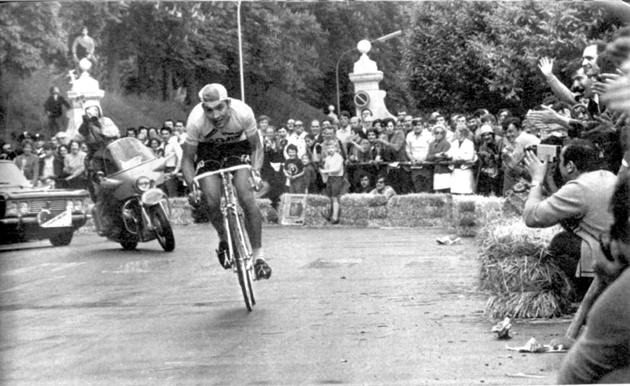 1975 Tour de France: Merckx rides the prologue time trial. 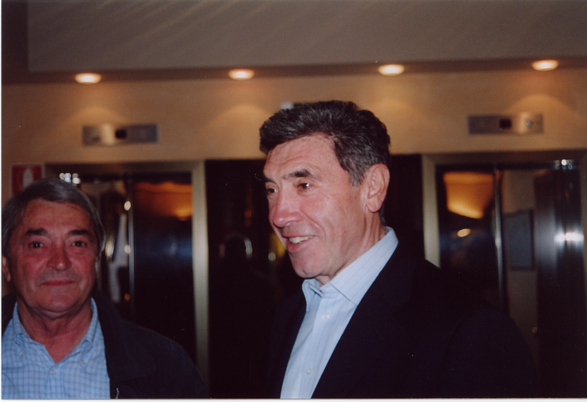 Michele Dancelli and Eddy Merckx on the evening before the 2004 Granfondo Gimondi. 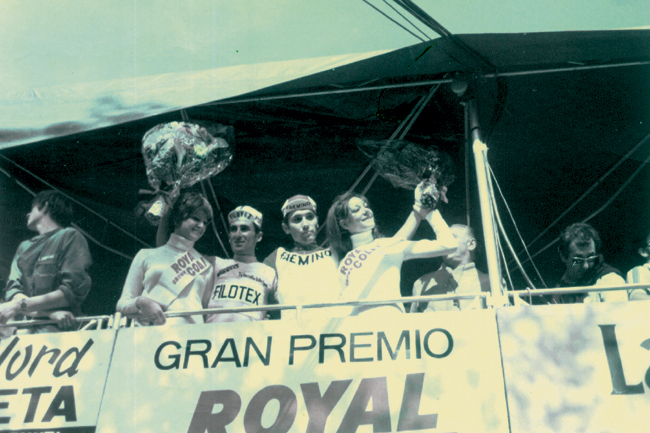 Valeria Paoletti photo. 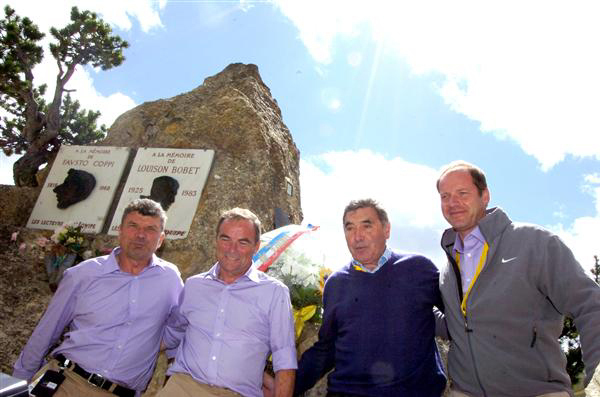 Stage 18 of the 2011 Tour de France: Bernard Thévenet, Bernard Hinault, Eddy Merckx and Tour boss Christian Prudhomme at the Coppi-Bobet monument on the Col d'Izoard.